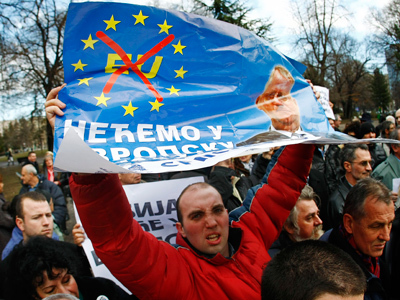 Thousands have protested in downtown Belgrade against the implementation of an EU-brokered pact aimed at normalizing ties between the Serbia and its breakaway neighbor Kosovo. Signed in Brussels in mid-April, "the landmark agreement between Belgrade and Pristina" is seen by ultra-nationalists as Serbia's recognition of Kosovo that declared independence in 2008. The protest was called by northern Kosovo Serb political leaders who also fiercely oppose the implementation of the 15-point pact. 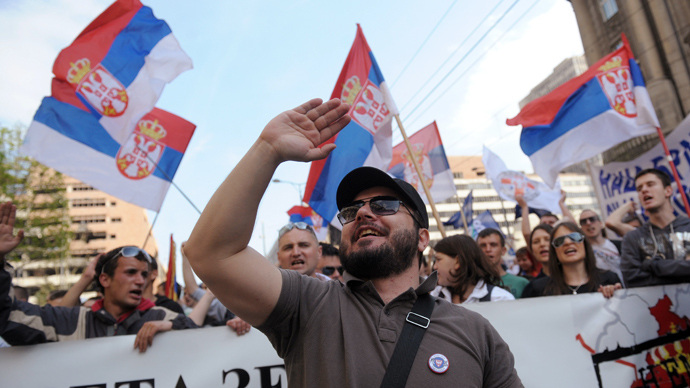 Serbia’s Parliament backed the deal in a 173-24 vote on April 26. Protesters gathered at Republic Square in downtown Belgrade at 12:44 local time (10:44 GMT) as a symbolic reference to UN Security Council Resolution 1244. Signed in June 1999 it placed Kosovo under transitional UN administration (UNMIK) and authorized KFOR, a NATO-led peacekeeping force. Many of those who attended the rally were wearing flags and chanted "Kosovo is the heart of Serbia" and "Treason!" referring to the government, which protesters are calling to reject the Brussels agreement. Banners unfolded above the crowd read “Serbia comes before everything else”, “We will liberate Kosovo”, “Kosovo is Serbia”, and “We will not give up Kosovo”. Reports on the number of protesters vary with local InSerbia news saying up to 10,000 people attended the rally, while AFP reported about 3,000 people. 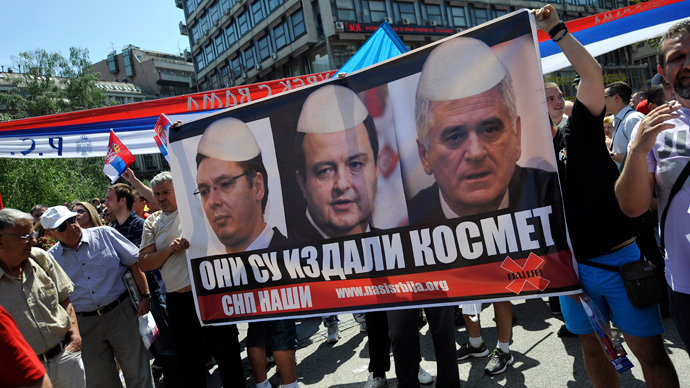 Top officials of the ultra-nationalist Democratic Party of Serbia, the country’s former Prime Minister Vojislav Kostunica, dignitaries from the Serbian Orthodox Church and officials, who strongly oppose the deal, addressed protesters from the stage. “We are just one of you, ordinary Serbs who have been forced by world powers, and recently by our own authorities, to fight and defend the lives of our children, our homes and holy places,” Slavisa Ristic, the Mayor of Zubin Potok, a city in northern Kosovo, said from the stage. He called the Brussels agreement a betrayal of Serbia, adding the government was intent on “selling Kosovo and the Serbian people”, local B92 news reported. They then continues their way towards the Russian embassy, where when arrived they started chanting “Serbia, Russia, We do need Union!” InSerbia news said. The agreement reached during the EU-mediated negotiations between Serbian Prime Minister Ivica Dacic and his Kosovo counterpart Hashim Thaci, provides for the merger of the four Serb municipalities in the north (North Mitrovica, Zvecan, Zubin Potok and Leposavic) subject to Kosovo law. This urban district would have powers over economic development, education, healthcare and town planning. Under the new deal, Serbs in northern Kosovo will have their own police and appeal court. Both sides also agreed to not block each other's efforts to seek EU membership. Prior to the deal, Serbia rejected an agreement proposal because the terms did not "guarantee full security and protection of human rights to the Serb people in Kosovo". The move is widely regarded as a step towards Serbia’s entry into the European Union. EU lawmakers called on the European Council to grant Belgrade long-anticipated candidate status at a session in March. However, Kosovo remains the main obstacle to accession. Belgrade and Pristina have seen sporadic ethnic tensions over sovereignty, as the Kosovo region has a Serbian population of over 220,000. The most serious in recent years was in 2004, when dozens of Serbian Orthodox churches across Kosovo were set on fire. In 2011 Kosovo Serbs proved their resistance against Pristina’s control, constructing barricades to prevent authorities from entering their enclave in a bid to show their opposition Kosovo’s independence, insisting the province – which has a majority Albanian population – was still part of Serbia. The both sides managed to agree that the border would be jointly policed.